If you can imagine an album recorded in 1963 filled with the nuances of a southern blues singer steeped in the traditions of his past and the reckoning of a newly awakened gospel-based, vocal-led music called soul. Enter a group of powerful backing musicians embracing that same, very urbanized period blues sound. Then imagine the technology of that era: tape machines and room sounds and the energy that happens when musicians are all playing live in the same room. Though this album was recorded in a series of 2017 sessions, it is a throwback to the old-school approach. 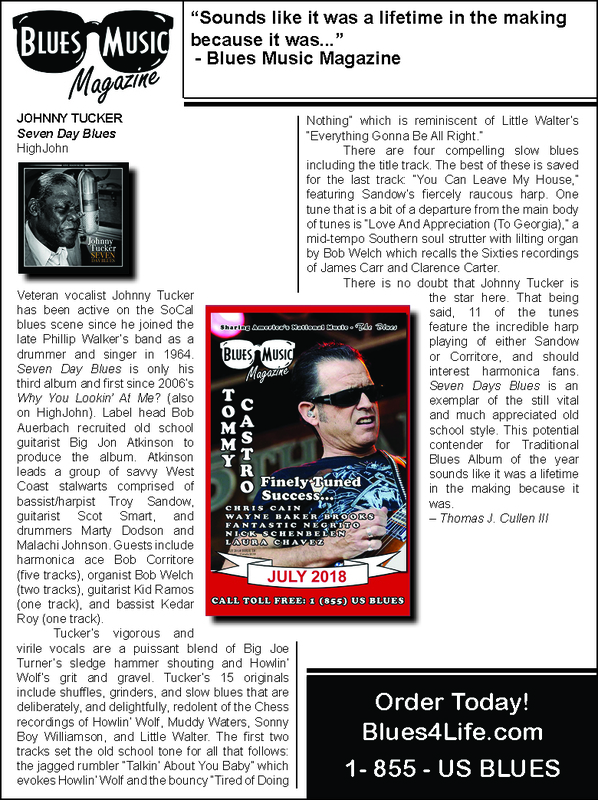 Johnny Tucker's powerful vocals were formed and stylized during that time period and remain strong and true, highlighted by Big Jon Atkinson's expertly informed vision of a true recording sound. On this gem of an album, Johnny Tucker delivers the command performance of his lifetime, handing you 15 original songs, his heart and soul, and leaving all doubters behind. Behold the record you likely thought impossible. Enjoy!